The essays of John Jeremiah Sullivan. John Jeremiah Sullivan is hot stuff right now. Still several years shy of 40, he is a contributing writer for The New York Times Magazine, contributing editor at Harper's, and southern editor of The Paris Review. 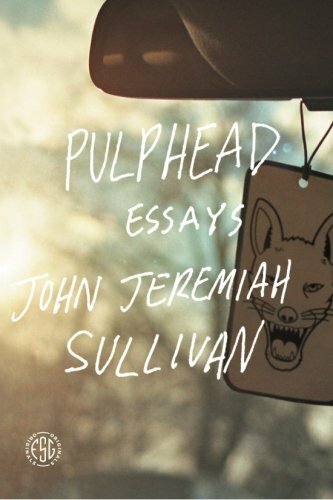 In a New Yorker piece last December called "Reality Effects," it was Sullivan's remarkable essay collection, Pulphead, that James Wood used as a springing-off point to proclaim that the American magazine essay is entering a sort of renaissance. Sullivan may be a new voice, but he's becoming an important influence on an emerging generation of essayists and critics. True, it's hard to ignore the similarities between him and the late David Foster Wallace. Both found success early in their careers. Both have an uncanny knack for the perfect adverb. And both have voices which are whimsical and ironic—but Sullivan is less self-consciously postmodern than Wallace; he sheds some of Wallace's slightly-too-twee bits (and copious footnotes) and adds a little southern grit.